BEIJING (AP) — Chinese authorities scrambled to contain a public relations mess over the disappearance of the former Interpol president during his trip home to China, saying Monday that he was being lawfully investigated for bribery and other crimes. But the government’s announcement did little to address concerns raised about the risks of appointing Chinese officials to leadership posts in international organizations. 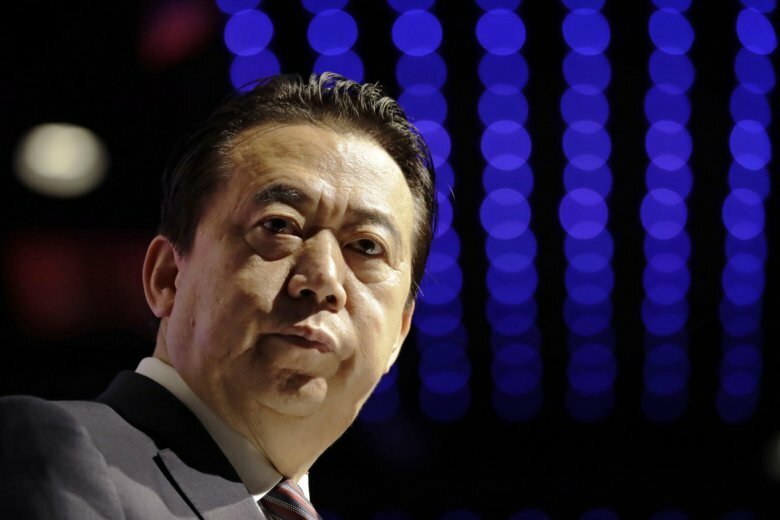 On Monday, the acting Interpol president told The Associated Press the agency had not been informed in advance of the Chinese probe into Meng Hongwei, who is also China’s vice minister of public security. On Sunday, Meng’s wife made a bold public appeal from France to the international community to help locate her husband. The appeal — especially unusual for senior Chinese officials — cast an unwelcome light on extralegal detentions that have increasingly ensnared dissidents and allegedly corrupt or disloyal officials alike under President Xi Jinping’s authoritarian administration. “We should deeply recognize the serious damage that Meng Hongwei’s bribe-taking and suspected violations of the law have caused the party and the cause of public security and deeply learn from this lesson,” said the announcement about the meeting, chaired by Minister Zhao Lezhi. Meng is the latest high-ranking official to fall victim to a sweeping crackdown by the ruling Communist Party on graft and perceived disloyalty. Most officials investigated by anti-graft authorities are quietly spirited away for questioning, cut off from contact from their families and not allowed access to lawyers, sometimes for months. But that wasn’t how it played out with Meng, 64, whose unexplained disappearance while on a trip home to China late last month prompted the French police to launch an investigation. The French government and Interpol also made their concerns known publicly in recent days. By late Sunday night, China issued a terse announcement that Meng was in the custody of party investigators, and shortly after, Interpol said Meng had resigned as the international police agency’s president. Meng could not be reached for comment. The revelation that Chinese authorities would be bold enough to forcibly make even a senior public security official with international stature disappear has cast a shadow over the image Beijing has sought to cultivate as a modern country with the rule of law. Willy Lam, a Chinese politics expert at the Chinese University of Hong Kong, said Meng’s case shows how Chinese officials, no matter where they are, have to obey the Communist Party first and foremost. “This puts China’s internal political struggle over and above the international norms on the rule of law,” Lam said. Rights groups had criticized Meng’s appointment as head of Interpol in 2016. They pointed to the lack of transparency in China’s legal system and the potential that the position would be misused to attack Beijing’s political opponents — by using the police group’s red notices to pursue political or economic fugitives, for instance. Zhang said the haphazard way the case unfolded suggested that officials were acting as if in some state of emergency. “China proceeded to do this in an unconventional manner without caring about its image. It is rather an insult to Interpol,” he said. The acting president of Interpol, Kim Jong Yang, said it had not been told about the investigation of its chief. “I find it regrettable that the top leader of the organization had to go out this way and that we weren’t specifically notified of what was happening in advance,” Kim said in a phone interview. “We still don’t have sufficient information about what’s happening (with Meng) or whether it has anything to do with Chinese domestic politics,” he added. Monday’s statement on the ministry of public security’s website provided no details about the bribes Meng allegedly took or other crimes he is accused of, but suggested that he was also in trouble for political lapses. Officials at the meeting were told that they “must always maintain the political quality of being absolutely loyal to the party,” the statement said. Questions about Meng’s case dominated a regular briefing by China’s foreign ministry on Monday. The spokesman, Lu Kang, rejected the suggestion that China’s handling of the Meng probe would hurt the country’s image abroad, saying that it demonstrated Beijing’s commitment to tackling graft. However, Lu did not directly answer questions about whether Meng would be formally arrested or allowed to hire a lawyer, or receive a visit from his wife. Grace Meng, his wife, made an impassioned plea Sunday for help in bringing her husband to safety. She said she thought he sent an image of a knife before he disappeared in China as a way to warn her he was in danger. The emotional appeal was an extremely unusual move for the spouse of a senior Chinese official to take, given the risk that public lobbying might backfire and lead to a heavier punishment. Many don’t have a chance to speak up even if they want to: spouses of officials under investigation, if they’re in China, would likely be placed under 24-hour surveillance, Lam said. “The terrible allegations made by Mrs. Meng provide the world with a rare window of opportunity to look at the way in which judicial processes are being handled in China,” Lam said. Associated Press writers Tong-hyung Kim in Seoul, South Korea, and John Leicester in Lyon, France, contributed to this report.